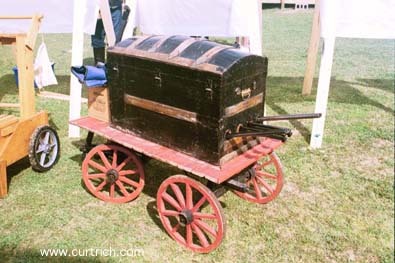 Unique, functional guncart for two. 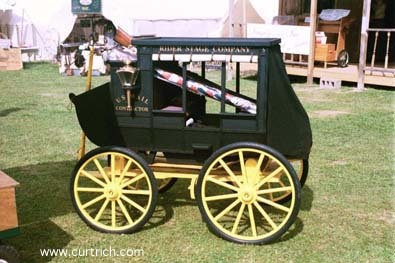 What a spectacular guncart! But I have nightmares of pulling it up the hill. It needs a couple of shetland ponies, maybe Rotweillers. With the latter you'd have no worrys about anyone messing with your stuff. This is the infamous hostage target on Stage 10. Hit the WHITE target 5 times with the second pistol, not the orange one in front. The poor hostage was killed a lot. 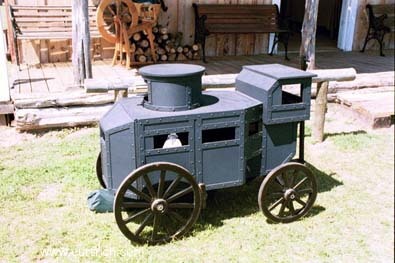 Yes, it's a true WAR WAGON, complete with miniature Gatling gun. 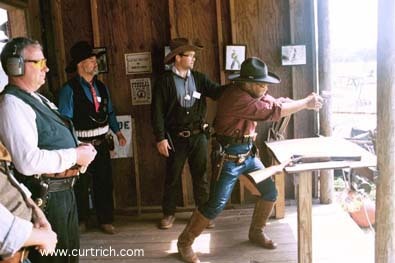 Again, I think it's seriously neat, but I wouldn't want to pull it up the hill at Tin Star Ranch, or even Gunsmoke. Okay, here's a shot of a guy shooting our stage. Happy now? 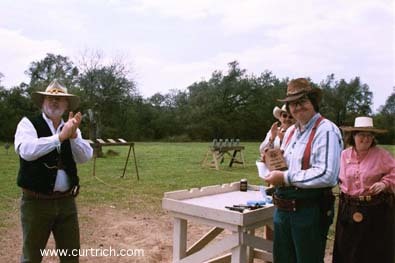 This is the Top Gun shootoff. Tell Sacket is the shooter. Capt. Baylor is on right, scoring, Capt. Aten on left, officiating. Tell won in a close match with Woody Duitt. And here Tell gets his well earned trophy. Wife Angels in the background. 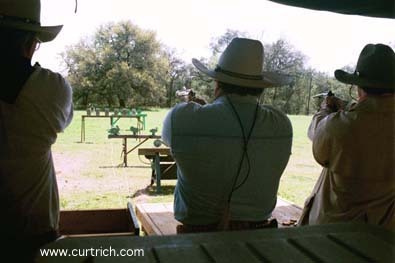 Here's one view of a team in the team shootout. Teams of 5, all the knock down targets in the world, including 5 in a row front to back, set up to require multiple hits simultaneously to fall. After you cleaned those, 4 shooters ran to different buildings where their rifles were staged and fired 9 shots at distant gongs. When done, they had to run back to the 5th shooter who had reloaded his pistol and moved outside. 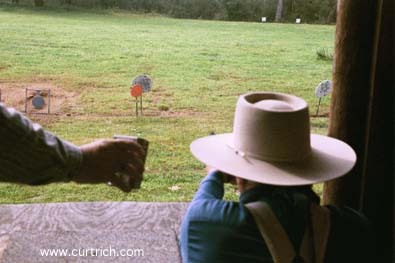 Once each of the other 4 shooters tapped him on the shoulder, he ran back inside and shot the gallery targets (those round ones in front. They're moving pretty fast.) Misses counted on the rifles and the gallery at 5 seconds each. Capt. Baylor's team won, mostly because Ridge Rider was our center. He missed only one of the gallery targets and shot 4 cylinders full at the knockdowns to my two. But Capt. Baylor did his part. 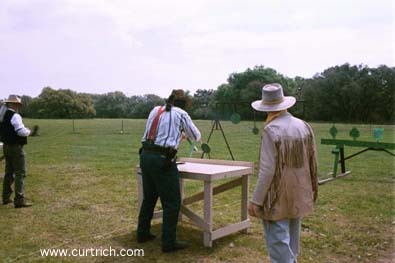 He used FULL CHARGE black powder loads to knock down the 5 in a row targets with 7 shots. The others (names lost, and not shown on the Trailhead Results. I'll get 'em and put 'em up here) did their part. The 4 of us had only one miss on the rifle targets, and it wasn't me.